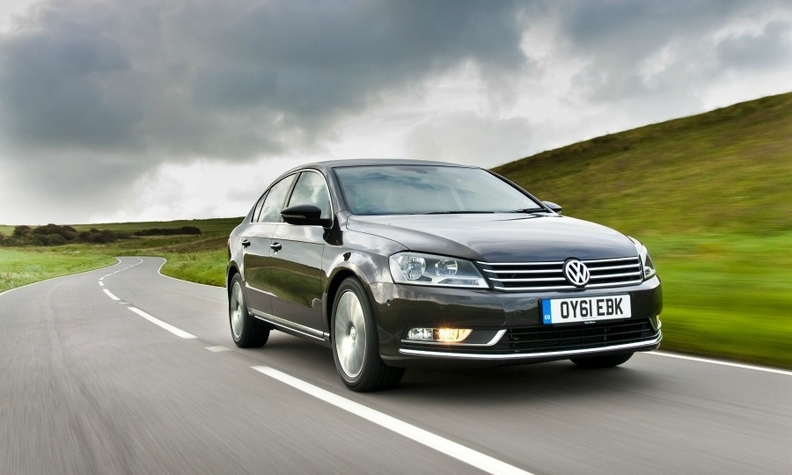 The VW Passat was Europe's top-selling mid-sized vehicle through April despite a 5% sales decline. A new generation will debut at the Paris auto show in October. Sales in the once-strong volume mid-sized sector are poised to fall this year to their lowest level this decade as pressure from premium alternatives mounts. Volume automakers are forecast to sell less than 500,000 mid-sized vehicles in western Europe this year, down from more than 800,000 in 2011, according to analysts at IHS Automotive. The steady decline has forced Toyota to re-think its plans for the segment. "It's very tough to be in the mid-sized segment in Europe," Toyota Europe CEO Didier Leroy told Automotive News Europe. When asked about the future of the poor-selling UK-built Avensis, whose European sales were down 28 percent through April, Leroy said there could be changes coming for the automaker's mid-sized model line. "The question is whether we should develop a specific car for Europe or shall we use a much more global product?" Leroy said. Meanwhile, IHS expects Honda will stop selling the Accord in Europe next year because of falling demand. Sales of the Japanese-built mid-sized sedan and station wagon were down 26 percent to just 1,377 units through April. A Honda spokeswoman said the automaker would keep selling the Accord in Europe next year but declined to comment about the car’s future beyond that. He cited the Nissan Primera, withdrawn in 2008, as one model that has already disappeared. A key reason for the segment shake-up is that mid-sized car buyers are switching to models from premium brands. 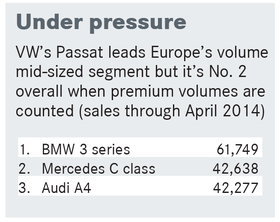 Through April, the BMW 3 series outsold the Volkswagen Passat -- the dominant model in the volume mid-sized segment (see box, left). In addition, the Mercedes-Benz C class and Audi A4 easily topped the No. 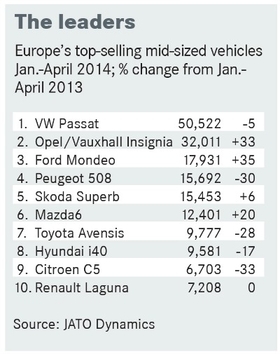 2-selling model in the volume mid-sized sector, the Opel/Vauxhall Insignia during the same period. That means premium models would have dominated three of the four top spots if their sales were counted in the volume segment. Strong demand for premium large-segment cars led most volume brands to quit that market class years ago. To counter the strength of the premium brands some volume automakers have increased the size of their mid-sized models, making them as big as the BMW 5 series in the next class up, said Christoph Stuermer, global lead analyst for PwC Autofacts. Ford is trying another way to win sales back from premium rivals. When the new mid-sized Mondeo goes on sale next year, it will be the first model line to offer Ford’s new Vignale premium trim line. Vignale variants will have more upscale interiors and offer more technology than lower trim-line models. Renault plans to do the same with its Initiale Paris trim line. Ford expects Vignale models eventually to account for 5 percent of overall European sales. IHS estimates that Ford will sell about 100,000 Mondeos in western Europe next year, more than double the car’s 2013 volume of 44,992, according to IHS’ figures. IHS predicts western European mid-sized sales will rebound to 560,000 in 2015 largely because of the Mondeo’s launch. It will remain to be seen, however, whether Vignale and Initiale Paris will be successful, PwC’s Stuermer said, but he believes both lines address the problem of limited trim levels within the segment. Opel/Vauxhall has used a different tactic to maintain interest in its mid-sized Insignia model line: aggressive pricing. In the UK, which is the General Motors’ subsidiary’s largest-single global market, Opel/Vauxhall last year cut the entry price of the face-lifted Insignia by about 2,000 pounds (nearly 2,500 euros). That means the Insignia’s UK starting price is the equivalent of about 20,000 euros, which matches the entry price of many volume compacts in Europe’s second-largest market. The strategy appears to be working. 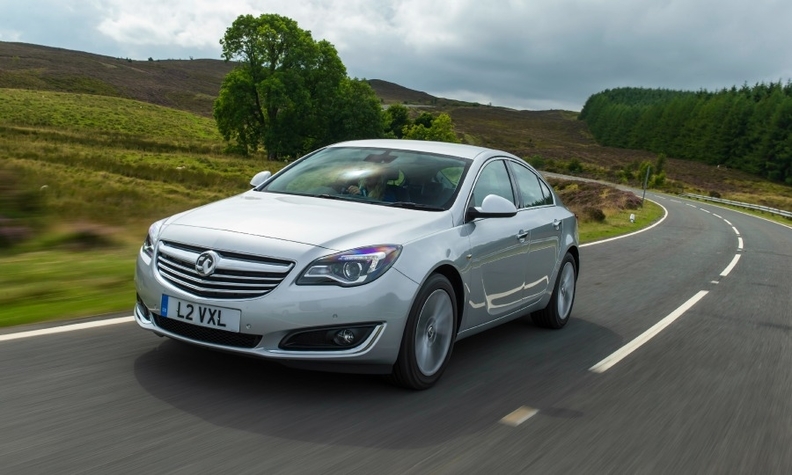 The Insignia’s unit sales in the UK and Europe are up by double digits so far this year. A new, fuel-efficient model that cuts CO2 emissions to 99g/km also helped boost sales an Opel spokesman said without providing detailed figures. While the volume mid-sized segment is not what it used to be, it remains crucial to fleet managers in Europe, PwC’s Stuermer said. “As long as the vehicles offer a good combination of comfort, safety, efficiency and cost, they will still have their niche,” he added. Carmakers can make money on them, he said, but only as part of a wider platform sharing strategy. He cited VW Group’s stated plan to put the next Passat on its MQB platform, which already underpins models such as the VW Golf and Audi A3 compacts. Such a move would result in cost saving for the Passat because of the economies of scale that come from being on such a prolific platform. MQB output is forecast to reach more than 6 million units during this decade.